Great fun where Rodney the magic rabbit vanishes and appears in a funny comical routine with a totally different ending to the original. 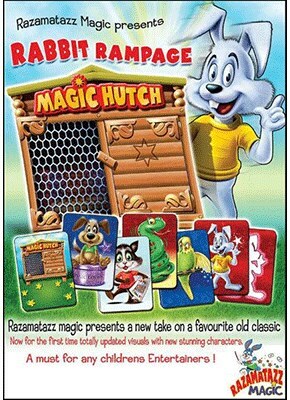 After Rodney rabbit vanishes, the magician can't see the rabbit peeping out of the side and top of his magic hutch. There is much audience participation as the children waste no time in shouting out where he is. Trick concludes with a surprise magical ending. This is a great trick with a magical theme for today's children's entertainers. Modern, colourful and keeps the children laughing and shouting in a controlled way that is a fun to see. You will be amazed at how stunning this looks. Never before has a children's prop looked so good. In the pack you will receive an attractive giant magic rabbit hutch and set of animal cards with the most beautifully illustrated characters you will ever see in any children's effect, all superbly made. The whole set comes in it's own special hard wearing PVC carry case for easy transportation. Which will help protect your set for many years. This is an absolute must for any professional or amateur children's entertainer.